Amazingly, Holly managed to save all his important data files on Starbug's computer before the disaster. Unfortunately for the crew, Holly considered his image files, aural circuits and Encyclopaedia of Fashionable Toupees to be the most important pieces of data to save. The Cat was mortified when he found his entire wardrobe had been shrunk to the size of a pea, until Kryten pointed out the Cat could finally have his greatest wish granted. By sewing Red Dwarf into a button on one of his suits, the Cat can now wear his entire wardrobe at the same time. Rimmer has returned to the crew after having one too many dreams about messing up an important rescue and ending up being permanently remembered as the Ace Rimmer who couldn't even swim five metres into a river to rescue a small child. Needless to say, he was able to find a replacement from another dimension and returned to the crew. The 'Welcome Back' party he threw for himself was the crew's first Hammond Organ recital for nearly a year. If Lister still missed Rimmer, three verses of "Roll out the Barrel" was enough to have him grinding his teeth within seconds. Kochanski has finally decided to stop looking for her perfect Dave, mainly because she thinks he will no longer be in love with her now she wears the same underwear for more than one day and downs a can of larger in under eight seconds. However, that doesn't mean she has fallen for Lister who at the moment seems to be quite content in pursuing his latest hobby with Kryten, Beer Can Art which involves Lister gluing crushed beer cans all over the mechanoid to make him look more arty. But as Rimmer puts it, "It's like sharing a ship with Robocop"
We see the inside of a giant spaceship, there are strange robots wandering around. Everything is very ominous. We see in particular two huge furry figures (think Chewbacca) sitting at the controls. 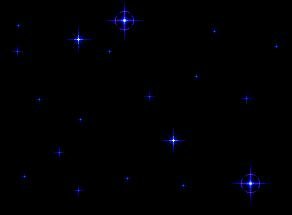 Tregarftsafred gratefarllkrteyrs cabritsanscors TRANSLATION : Technicians, Third Class on the Starship Gitantica of the Sacred Order of Dawratiga (SOD). All the dialogue is said in the same language with subtitles as below. BOB : Anything on scanners? DAVE : Nope, I've seen more interesting things crawling all over my scalp. DAVE : How did he know? BOB : He found some of their weapons and instruments of torture floating in a pod. (He holds up a beer can) We believe this is a device for crushing sexual organs. BOB : (Holds up one of Lister's old T-shirts) They appear to have developed lethal chemical weapons. DAVE : How barbaric! (Holds up one of Lister's half eaten curries) What's this? BOB : We believe it to be the remains of one of the creatures they tortured. As you can see, they have no mercy whatsoever. DAVE : We've found them! BOB : I'll call the boss. A few seconds later, another Chewbacca lookalike walks in. BOSS : This better be good, I was just being de-fleaed. DAVE : We've found the humans, sir. BOSS : Are you sure it's them? BOB : We're just identifying the ship. We see a panel light up with the schematics of Starbug. BOSS : Show me their captain. Another picture appears, this time it is of Rimmer in a very sad macho pose. Underneath it says: "Captain Arnold J. Rimmer, Space Adventurer", there is also a section labelled 'Additional Information' which has obviously been filled in by Lister as it says "Total Smeghead." BOSS : This is him....the scourge of all people. BOB : What shall we do, Boss? BOSS : What day is it today? DAVE : Third Quarter after Quasaquom. BOSS : That means it is our day of rest... Ah well, seeing as it's a public holiday we'll just blow up their ship, take prisoners and conduct mean and hideous tortures. BOB : A good plan, sir! 2. Int. Starbug. Lister's Quarters. We see Lister grimacing and looking in great pain. We can only see his face, he is shouting very loudly. LISTER : Please! Kriss! No more! I'm begging you! I can't take any more!! We pan out to see Kochanski behind him trying to help him put on a pair of jeans. Most of the following dialogue is shouted, or said very angrily etc. LISTER : Just face it, Kriss, I can't fit into Size 14s any more! KOCHANSKI : Just try, Dave! LISTER : I told you (gasp) I'm perfectly happy with long-johns! KOCHANSKI : No way! I'm not spending another day in the cockpit with those horrible things! Last week I had to completely reprogram Holly because he was convinced we had a flood of urine all over the ship! LISTER : But I hate jeans! It's like having a fat barmaid permanently clinging on to both your legs! KOCHANSKI : I agree you may have to lose all comfort and be forced to be in constant agony....but that is what fashion is all about! LISTER : Now I know why 20th Century models were so thin, they'd have all suffocated otherwise! There is a little more struggling before Kochanski lets go, Lister falls over. They both lie there, trying to get their breath back. As they're lying there, Rimmer walks in. He is surprised to find them near each other, panting with Lister's trousers loose. RIMMER : Not interrupting, am I? KOCHANSKI : No, I was just finishing. RIMMER : (Jumping to the wrong conclusion) Oh really? Are you sure? Because if you want another few minutes of sordid passion then I'll go. But could you please stop bashing against the floor whilst you're at it, we're trying to pilot the ship from down there and it sounds like a Sumo Wrestling Convention! RIMMER : Why? Did they get damaged when she ripped them off with her teeth? KOCHANSKI : (Angrily) Rimmer! I was just trying to teach Dave a little about coordinated dress wear and how to look slightly less disgusting than a baboon in a tar pit! The least you can do is be supportive! CAT : Hey guys! What's happening? (Sees Lister) Woah! Why the hell are you wearing those? They look about as co-ordinated as the Swedish entry in 'Come Jiving'! LISTER : That's it...I'm going back to long johns. KOCHANSKI : Oh no! Listen, maybe if we just got your waist a bit slimmer...you should try one of my diet books, you'll lose weight in no time. I know it may be an inconvenience if you have to throw up after every meal, but trust me, you do get used to it after a while! Holly appears on a monitor wearing a long black wig. HOLLY : All right, dudes? LISTER : Holly, what the smeg is that? HOLLY : I'm changing my image, Dave. According to my database, this'll take twenty years off my life. RIMMER : Twenty years off your sanity, more like. KOCHANSKI : It doesn't look very good. CAT : Yeah! I've seen more fashionable hippies! KRYTEN : Good morning, sirs. He sees Lister and Kochanski on the floor, Holly with his wig and Rimmer and Cat standing nearby. LISTER : It's all right, Kryten. Nothing's going on. KRYTEN : Sir, I haven't heard such a blatant lie since you tried to hide from me exactly what humans do with suppositories. Suddenly there is a huge explosion, everyone is thrown to the ground. HOLLY : Umm... I believe we're under attack. HOLLY : Err... George Jetson? LISTER : Let's get down the cockpit! Everyone leaves, Holly is still onscreen for a moment. 3. Int. Starbug. Front Cockpit Section. Rimmer and Cat run in first followed by Kryten and Kochanski. Lister runs in pulling on a pair of trousers. KOCHANSKI : (Eyes closed) Can somebody tell me when it's all over! KOCHANSKI : I was talking about Lister getting dressed. RIMMER : Don't worry about it, Miss Kochanski, you get used to it after the first year or so. Mind you, I've never been able to watch documentaries about whales mating in quite the same light after seeing some of the hideous creatures Lister has been attached to in the past couple of years. I thought I was ready for any horror. (Sees Kochanski staring at him) Oh, I didn't mean you, Miss Kochanski. KOCHANSKI : I should think so. LISTER : Let's just get on with the job in hand, OK? CAT : If it means you'll get dressed quicker, sure! KRYTEN : I've got a picture of the attacking craft, punching it up. We see a fuzzy photo of some sort of spaceship. CAT : What the heck is that! KRYTEN : I'm sorry about the picture quality, sir, but I hadn't got around to fixing the camera system since Lister reprogrammed it. KOCHANSKI : (Interested) Hold on a sec... What do you mean? KRYTEN : Well for some bizarre reason, Mr. Lister seemed to concentrate all the imaging software onto one camera on A-Deck. I can't think why. RIMMER : Well what's on A-Deck? LISTER : What's the matter? Am I the only person on this ship with an interest in amateur photography? KRYTEN : Very amateur if those initial shots were anything to go by, sir. KOCHANSKI : (Angrily) What exactly were they pictures of? KRYTEN : I can't recall exactly, but I remember thinking that Mr. Lister had a very keen interest in beds� LISTER : Well what else am I supposed to do on a ship where the only magazines are "Up, Up and Away", a few copies of Rimmer's "Angling Today" and Kriss' back catalogue of "Cosmopolitan"? KOCHANSKI : How did you know about my Cosmopolitans? LISTER : They were the only thing I could find under your bed. KOCHANSKI : I can't believe you guys! It's like being in a 24 hour peep show! CAT : Are you saying you have a problem with that? KOCHANSKI : What has society sunk to when the only use you can find for photography is to get cheap shots of my bed? Suddenly there is another huge explosion, everyone is thrown out of their seats. LISTER : What are we going to do? RIMMER : Maybe if we ignore them they'll just get bored and go away! Holly appears on screen, he's totally bald. CAT : Ahhh! It's a dog!! HOLLY : All right, dudes. Didn't mean to startle you. LISTER : What the smeg is that, Hol? HOLLY : Well, I was looking for a new style and then I remembered the old saying that 'bald people have more fun'. KRYTEN : I think you'll find that it's blondes, sir. HOLLY : Is it? Now why did I get those two mixed up? RIMMER : Maybe it has something to do with the fact that you're stark raving mad? KOCHANSKI : Actually, Rimmer, some people find bald men very attractive. LISTER : (Uncomfortably) Really?....What sort of people? Camera pans from Kryten to Holly. KOCHANSKI : ...or so I've read. LISTER : (Still uncomfortable, now clutching his dreadlocks with a worried look on his face) So you don't like bald men in general? KOCHANSKI : Not really, no. Lister kisses his dreadlocks and puts them back behind his head. KOCHANSKI : Mind you, I'm more worried about actual hairstyles than anything else. Stuff like dreadlocks is just such a big turn-off. LISTER : How big? Big enough to ruin a heated moment of passion? KOCHANSKI : I'd be more afraid of getting carpet burns than indulging in any passion. RIMMER : (Very anxiously) Excuse me! I know you may all find it incredibly interesting to be talking about the excuse for fuzz that sleeps atop Lister's head, but we are under attack here! Another explosion hits the ship. KRYTEN : I stand corrected, they do appear to be firing at us. LISTER : It's like they're firing at every few minute intervals. What's going on, Holly? CAT : Whatever they are, they're firing strong stuff! Those lasers have more energy than Hermann Goering in Saturday Night Fever! CAT : Well, it was some guy who liked dressing in womens' shirts. HOLLY : I have identified the aliens suing information collaborated from my Toupee encyclopaedia and the Ladybird Book of Gestalt Entities. RIMMER : What are they? HOLLY : They're a particularly violent race of murderous hairy GELFs who were created by humans in order to try and get rid of all the other GELFs and Simulants who they created before and suddenly decided weren't such a great idea after all. KOCHANSKI : So why are they attacking us? HOLLY : I think a couple millennia of solitude and loneliness flying around space with only their fleas for company has driven them against their masters and turned them against us. LISTER : Is it just me, or do all GELFs we meet seem to have done that? KRYTEN : I've got some more information....apparently they've been following us since Red Dwarf was compacted.....after retrieving some of the debris and through perusing us, they think we're the sort of humans who enjoy cruel and unusual torture. 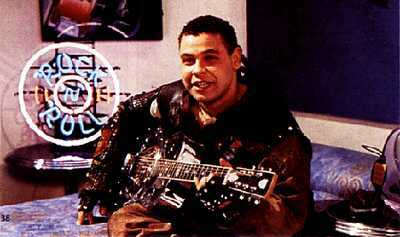 RIMMER : Was this that day last week when we let Lister play his guitar? HOLLY : They're not negotiating....they want to see us fry slower than a beefburger on a British made barbecue. CAT : So what do we do? KOCHANSKI : No way, Rimmer. We're not surrendering. RIMMER : Very well. You'll excuse me then if I carry out my normal defensive procedure. Rimmer disappears out to Mid-Section. LISTER : I think we should commemorate that scanner table to him. KRYTEN : How do you mean? LISTER : You know, stick a plaque on it saying 'Arnold Rimmer Had a Little Cry Under Here' or something. There's probably more tears down there than at the World Onion Slicing Championships! CAT : Right! He's got less bottle than a meeting of 'Alcoholics Anonymous'! KOCHANSKI : I don't understand how he managed to get into the Space Corps in the first place....don't you have to undergo a survival course to become a technician? LISTER : Kriss, to become a technician you just have to have a brain and at least two functioning limbs. How do you think Petersen managed it? HOLLY : OK, dudes. I've calculated that the ship is firing exactly every three minutes. KRYTEN : Why every three minutes? HOLLY : I dunno... I may have an IQ of 6000 but that doesn't mean I can interpret the behaviour of mass murderous killing machines. LISTER : It's easy, Hol. You just walk up and say 'hi', and if they fire their guns at you then you can assume they're hostile. CAT : Either that or you're just too damn ugly! KRYTEN : Maybe we can use their firing pattern to our advantage. KRYTEN : Well, if we accelerate straight ahead after the next burst, we will have three minutes to get a good distance ahead and be able to dodge the next burst, maybe we can even use it to propel us forward. KOCHANSKI : Do you realise that if we fly away, they might become even more hostile and fire quicker? CAT : (Surprised) Are you saying they can change how often they fire? That's so unfair! How do we get a chance to escape if we don't know how often they fire? LISTER : That's the idea, Cat. CAT : And that's how war is fought? No wonder you monkeys kept dying, you all cheated! KOCHANSKI : Let's just keep to the job in hand. Personally, I think Kryten's idea is totally stupid, deranged and witless......I guess that means we'll be doing it. LISTER : You got it. CAT : She's getting good at this, isn't she? LISTER : Holly, give me full power! HOLLY : OK, switching to full power. A little light on the control panel reading 'Full Power' switches on. No other changes are evident. We see Starbug turn and fly away from the Battlecruiser. It waits a second before coming in pursuit. CAT : They're coming at us! KRYTEN : It looks like my plan didn't quite work....in the event of our untimely deaths as a result of my actions, I will of course turn myself in and face a tribunal. KOCHANSKI : Well you didn't expect it to work, did you? It was about as inspired as one of Rimmer's chat up lines! RIMMER : I thought you guys might need my help. KRYTEN : Sir? Are you feeling OK? RIMMER : No, I'm going insane...that's probably why I'm here to help with whatever daring plan you've come up with. HOLLY : I think that last shot must have damaged the Holo Projection Unit in the engineering decks, restarted some of his old Ace Rimmer files and given him a 'bravery boost'. LISTER : Just think of Prozac without the side effects. RIMMER : So what daring plan have we come up with? LISTER : Well at his precise moment, Rimmer, we're running away from them as fast as we can! RIMMER : Sounds good to me, let's keep going! We see Starbug being hotly pursued by the Battlecruiser. The Boss is sitting in the main seat, Bob and Dave are in front. Once again the dialogue appears as subtitles. DAVE : Shall we continue to fire as before, sir? 5. Int. Starbug. Front Cockpit Section. All crew members still in seats, laser shots are coming every few seconds. KRYTEN : We can't hold them off! CAT : Metal-man is right! They're so close my nose is tingling like a tambourine chorus! RIMMER : There's a conveniently placed small moon just ahead... Do you think we can make it? LISTER : Have I ever let you guys down? LISTER : Just hit the thrusters. RIMMER : I know what they are but we've already got them on. LISTER : Are you saying this is the fast we can go?! KOCHANSKI : Well what were you expecting from a transport ship with so many miles on the clock that we're practically running out of little dials! LISTER : Holly! Get some speed up! Holly appears with a huge stripe of blue hair. RIMMER : Holly! Get that ridiculous hair off! HOLLY : Ridiculous? I'll have you know that I've been driving the dispensing machines crazy with this new look.....They're already calling me 'Randy Holly'! CAT : That does not sound like a compliment! HOLLY : It is from the dispensing machines, believe me. Again we see the alien ship is very close behind. LISTER : Only a few more seconds until we reach that moon! CAT : Only a few more seconds until we're People Puree! KOCHANSKI : They've got missiles! RIMMER : Fan-smegging-tastic. What else could go wrong? KRYTEN : Well sir, seeing as you asked I thought now might be the time to mention that we have a fuel leak. RIMMER : What sort of fuel leak? KRYTEN : Oh, you know, the type where all the fuel goes sloshing out the back of the ship like a drunk man washing his car with a hose. KOCHANSKI : Isn't that a little dangerous considering we're being shot at? KRYTEN : No... It's extremely dangerous. LISTER : Oh well, at least I really go out in that blaze of glory I wanted. RIMMER : Lister, if we do die I demand to be splattered across a different asteroid! CAT : Approaching the moon! We see the moon, a rock covered waste. Starbug is approaching, full speed. KRYTEN : Sir, there's nowhere we can land! It's like trying to find parking space outside a cinema! LISTER : We'll just have to improvise. CAT : Improvise?....Is this a 'soft cushiony landing' type improvise or a 'big bumpy, possibly fatal' landing type improvise? LISTER : Big and bumpy. CAT : Phew! I knew it was a good thing putting on gold this morning! Lucky we're not likely to survive or I would have had to change! KOCHANSKI : You'll never do it, Dave! LISTER : Just watch the master, Kriss. KOCHANSKI : If he comes along I'll be right behind him! (Checking her seat) Hey! Where's the damn seat belt on this thing! KRYTEN : (Knocking his head) That's what I forgot to do when renovating the ship to allow Miss Kochanski in the cockpit! KOCHANSKI : Wasn't that a little irresponsible? Kryten looks at Kochanski and then does up his own seat belt. KRYTEN : Just hold on tight, Ma'am. LISTER : I'll try and take us down over there! RIMMER : No way, Lister. Landing on an unsuitable area breaks ever single Space Corps directive ever issued... Except the ban on Welsh members working in the Farming Corps. LISTER : Would you care to try something else? RIMMER : Maybe we can use some of your enormous underwear to make a handy set of parachutes? HOLLY : Sorry, dudes, but this moon appears to have gravity. HOLLY : I'll try and warn you all when we're about to hit the moon's gravity field so you can take evasive action. LISTER : What sort of action? HOLLY : I dunno! Just try wiggling the stick and see what happens. KRYTEN : Sirs, ma'am, seeing as the chances of our deaths are very high and as I, as a mechanoid, may survive with at least one limb intact. May I take this opportunity to ask you all how you'd like to be buried? KRYTEN : It's standard procedure, ma'am. What about you, Mr. Lister? LISTER : I want a huge coffin made of the packets of chicken vindaloos, and I'd like to be entombed in larger and dill pickles inside! KRYTEN : If you don't mind sir, I'd rather just cremate you and be done with it. Suddenly there is a jolt, Starbug begins plunging downwards. We hear general cries of anger, frustration, rage and "Oh damn, my hair is loose" and "Oh look, I've cracked a nail....." before Starbug plunges onto a mountain and slides downwards fifty feet before coming to rest at the foot. There is silence. HOLLY : OK, dudes, We're about to enter the gravitational field so hold on tight and... Oh, right... You've got it in hand.